Accommodation in Deluxe room for 3 nights on Twin sharing basis. These packages will not applicable from 15th Dec 2012 till 5th Jan 2013. Courteous service and efficiency combined to make your stay a pleasant and memorable experience. Located just a 5 minute walk from the beautiful Calangute beach, Delta Residency is the ideal address for the business traveller or a perfect family vacation. Accommodation is on twin-sharing basis with a provision for an extra person. All rooms have a refrigerator, cable TV and 24 hours running hot and cold water. It has swimming pool with jaccuzi & sunbeds open to the bar, multicuisine restaurant / bar, conference facility, internet facility & many more. 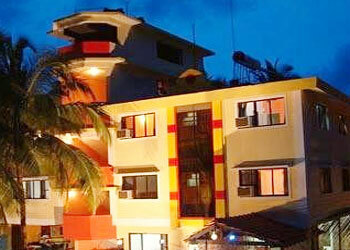 One day sightseeing of North Goa and One day sightseeing of South Goa by Non AC bus. One hour boat cruise on Mandavi river. Complimentary use of swimming pool with proper costumes.